(AFP) - Thousands of South African workers staged nationwide demonstrations on Wednesday to protest against high unemployment and government policies they say have failed to create jobs and are deepening poverty. 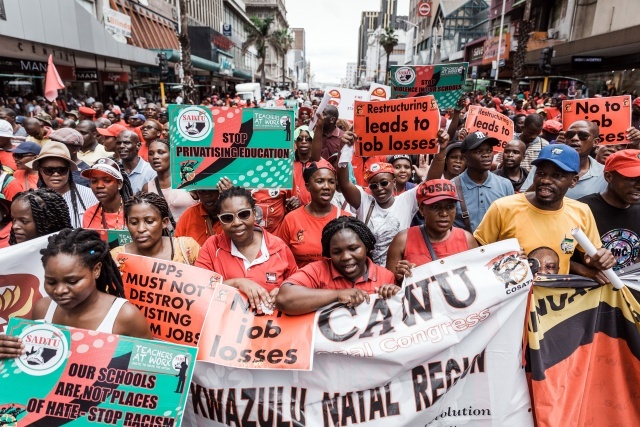 Workers dressed in red t-shirts, showing their loyalty to the trade union movement, gathered in the eastern port city of Durban, Johannesburg and other locations for open-air rallies three months ahead of the country's general election. Companies in South Africa, notably in the mining sector, have shed tens of thousands of jobs in recent years in what unions have termed a "jobs bloodbath" as the economy of Africa's most industrialised nation struggles for growth. "Today's march is a national strike and we are marching to (say to the) government and the private sector, we cannot afford to lose jobs in this country," Losi told reporters. Singing anti-apartheid songs such as "Senzeni na" ("What have we done? "), workers marched through the city centre dancing and "toyi-toying", a protest move synonymous with the struggle against apartheid. Carrying banners that read "we demand decent jobs", "no to job losses" and "no to outsourcing and privatisation", marchers were undeterred by drizzling rain. "Today black children are educated but there is no work," union member and domestic worker Gloria Sithole, 58, told AFP. Marcher Ben Venter, deputy general secretary of the South African Society of Bank Officials, told AFP that President Cyril Ramaphosa needed to act on initiatives that would set employment on "an upward trend". "The South African economy can't afford job losses," Venter said. South Africa's economy grew less than one percent last year and is currently subjected to its worst electricity cuts in years. Also among the union's demands was an end to state corruption and mismanagement. The continent's largest energy utility Eskom, plagued by debt and mismanagement, plunged the country into darkness this week with periodic black-outs imposed as demand outstripped supply. The trade union's leadership continued to throw its weight behind the ANC. "We are in no way abandoning our ally," COSATU official Amos Monyela told AFP. "We will mobilise our members to vote for the African National Congress but we will always challenge policy uncertainty that affects workers."